IN THE NORTH OF THE IBERIAN PENINSULA! At our door, you will discover the treasures of the sierras and atypical landscapes of Catalonia, Navarre and Aragon at the beginning and the arrival of Barcelona. This superb 5-day trip, with a majority of beautiful trails adapted to the trails, will surprise you with its variety and quality. Proposed formula: "GUIDE" (with guide and assistance). 5 days ridind / 5 nights half-board on departure / arrival in Barcelona. Approximately 1120 km (70% off-road) without technical difficulties. DAY 2. Barcelona - Cellers (240 km) From Barcelona, we will begin the journey by trails between forests and cornfields that will lead us to more mountainous landscapes. Lunch to Solsona. We will then climb in the foothills Pyrenees and its beautiful clear slopes always offering amazing views. Dinner and overnight at the hotel *** at the edge of Lake Terradets in the Pyrenees. DAY 3. Cellers - Huesca (220 km) Beautiful day of medium mountain with the peaks of the Pyrenees in the background. Passage by the lake of Caneles in the morning between sierras. Lunch to Barbastro. The afternoon will be rolling in the often sandy plains of Aragon. End of the day in Huesca, hotel *** for the evening and the night. DAY 4. 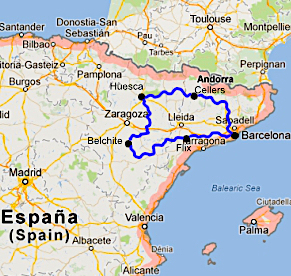 Huesca - Belchite (210 km) Superb motorcycle day, we will cross the "desert" of Monegros east of Zaragoza. Lunch in Penalba. 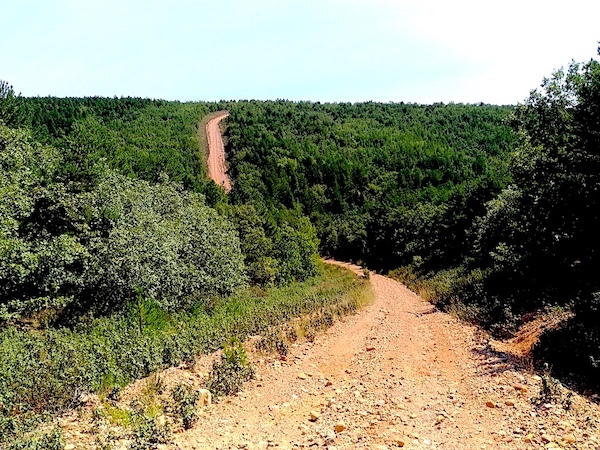 In the afternoon we will drive on very beautiful paths of Penalba, very rolling tracks in the country of Baja Aragon. Dinner and overnight in *** hotel in Belchite. DAY 5. 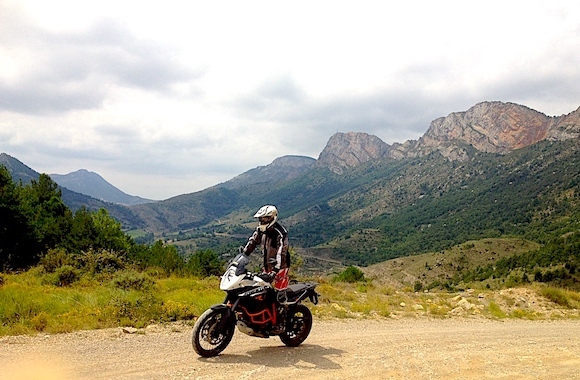 Belchite - Flix (240 km) Another exotic motorcycle day. We will leave Belchite from the south where the tracks will make us discover magnificent panoramas. Lunch in Arino. After Alcaniz, we will then drive in the wooded pine forests. We will descend to Flix to end this breathtaking day. Dinner and overnight at the hotel ****. DAY 6. Flix - Barcelone (210 km) Already our last day of happiness. Spanish tracks, which will begin with the Sierra del Boix offering us beautiful way between pines and olive trees. Lunch at Solivella. We will then drive in the Montsant Natural Park. We will close the loop by the forests to complete this superb journey. End of course at the departure hotel. According to the choices of each, you have the possibility to extend your stay in the hotel **** Spa & Golf 30 minutes from the city center of Barcelona..
Tout d'abord merci de nous avoir permis de passer une semaine formidable !! !